The object of this game is to score as many points as possible by placing all the balls into corner goals. 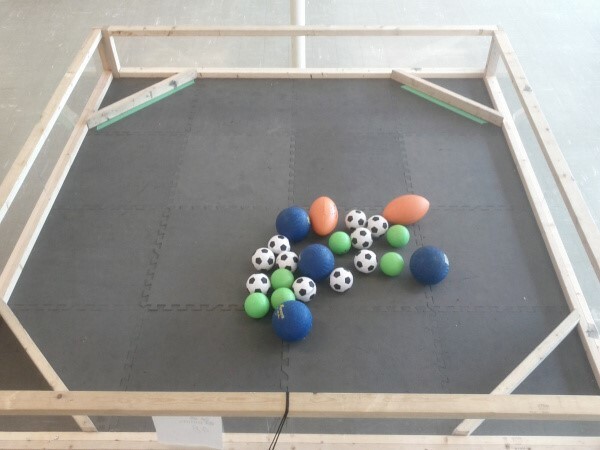 Each bot and its controller will have 1 minute to clear the field by picking up and placing the balls in the 4 corner goal areas. The goal area posts can be moved, but must be put back before time expire. All balls must be touching the game floor mat before and after the game. Combination options: 1 bot at a time, 2 bots at a time, 4 bots at a time. The table size is 8 feet by 8 feet.